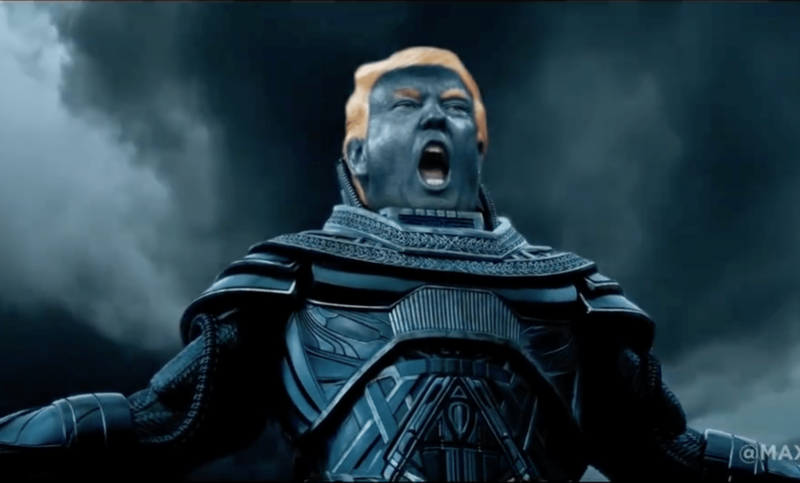 25/07/16 Is Donald Trump a Superhero? I know, weird question, but I’m not the one asking it. 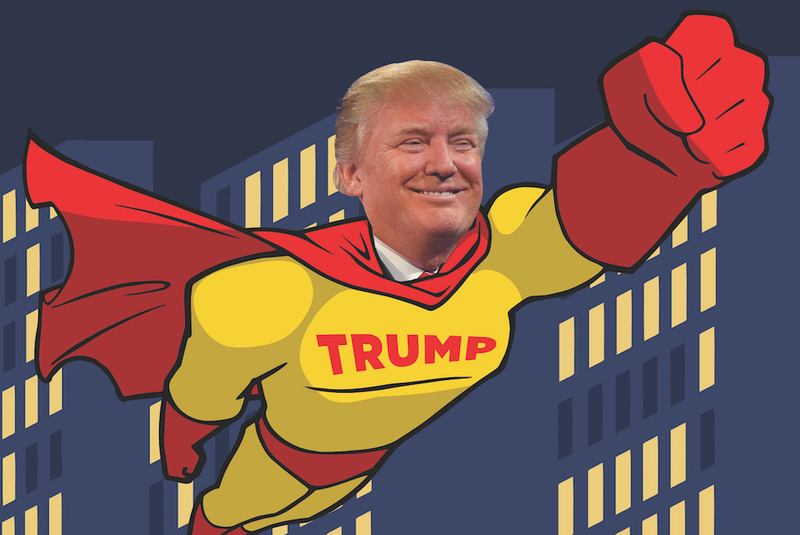 I count a dozen commentators in the last year who think Trump deserves spandex and a cape. 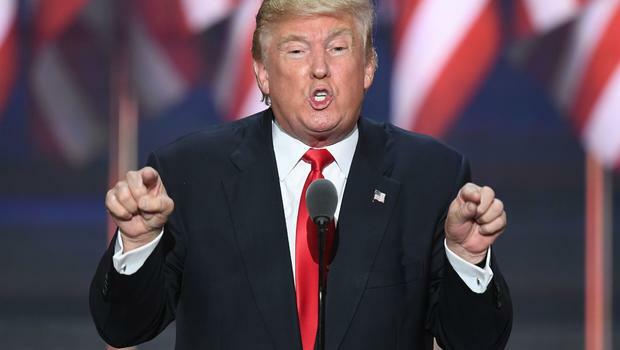 That’s probably not the Batman the kid at the Iowa State Fair had in mind when he asked Trump about his secret identity. But is it the Batman we could end up with in November? 18/07/16 Layout Wars! Kirby vs. Steranko! When did the Silver Age of comics end and the Bronze Age begin? There’s no definite year, but the 1973 “SNAP!” of Gwen Stacy’s too-perfect neck in Amazing Spider-Man #121 is a contender. 1970 is a bigger year, with Jack Kirby’s move from Marvel to DC, plus the start of Neal Adams and Dennis O’Neil’s Green Lantern / Green Arrow. Steve Ditko left Marvel for Charlton in 1966, turning both Spider-Man and Doctor Strange over to new artists for the first time. Marvel veteran Bill Everett took on Doctor Strange with Strange Tales #147, but for me Strange Tales #154 is the sea-changing Silver-to-Bronze moment. It’s the first episode of Nick Fury, Agent of S.H.E.I.L.D. that the recently hired Jim Steranko wrote, penciled, and inked in 1967.
and two full-page panels (including the opening splash). #151: Ten regular 3-row pages (including four implied and two actual 3x2s), one regular 2-row page, one full-page panel (splash). #152: Ten regular 3-row pages (including seven implied and two actual 3x2s) one regular 2-row page, one full-page panel (splash). #153: Nine regular 3-row pages (including seven implied and one actual 3×2), two regular 2-row pages (one implied and one actual 2×2), one full-page panel (splash). Kirby draws no irregular layouts, so panel heights are consistent on each page and, since three-quarters of the layouts are regular 3-row based, across a majority of pages too. Of the thirty-six 3-row based pages, twenty-six are also 3×2 (typically implied, occasionally actual). The percentage is higher in Kirby’s last two issues, with seventeen of nineteen regular 3x2s. All rows include either one, two, or three panels of equal width. When he does vary from 3-row layouts, he uses 2-rows instead, averaging two 2-row pages per issue. Each issue begins with a full-page splash panel and ends with a 3-panel row in a regular 3-row page. 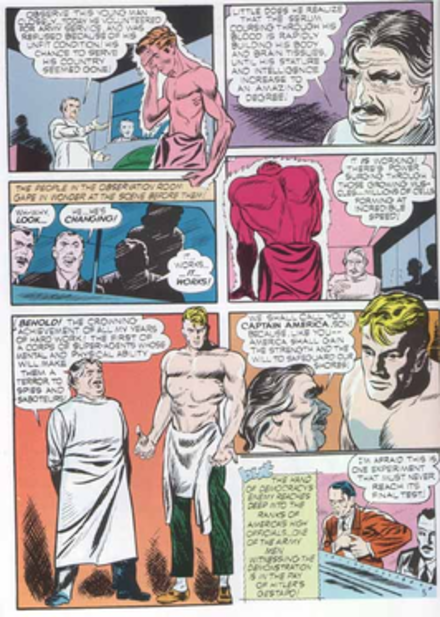 Excluding full-page panels, each issue includes between five and eight pages with a full-width panel; twice in one issue, two full-width panels appear on the same page. Kirby draws no full-height panels or sub-columns, so all reading is horizontal. All panels are also rectangular and framed by gutters. Kirby draws no insets or overlapping panels. The overall effect is lightly varied and highly orderly. #154: Four regular 3-row pages (including one implied 3×2), three irregular 4-row pages, two full-page panels (including the opening splash), one irregular 2-row page, one regular 2×3, one mixed column-row page. 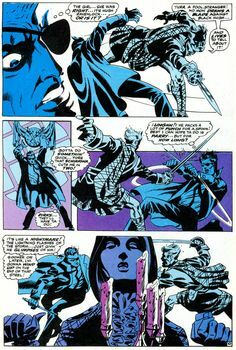 Only three of Steranko’s layouts appear in Kirby’s issues: two full-page panels and an implied 3×2. Like Kirby, Steranko favors regular rows, although not exclusively. Unlike Kirby, Steranko’s 3-row based layouts are a minority, comprising one-third rather than three-quarters of the total pages, and where slightly more than half of Kirby’s pages are 3×2 based, Steranko’s one implied regular 3×2 is the rarity. Three of Steranko’s regular 3-row pages lightly modify Kirby by including three new elements. First, two rows are divided into four panels; Kirby’s rows never exceed three panels. Second, some panels are irregular, and so their widths vary within the same row; Kirby’s panels are always divided equally. Third, two full-width panels include insets, effectively creating a row of two irregular panels; Kirby draws no insets. a regular 2×3; an irregular 2-row; and a mixed column-row page. 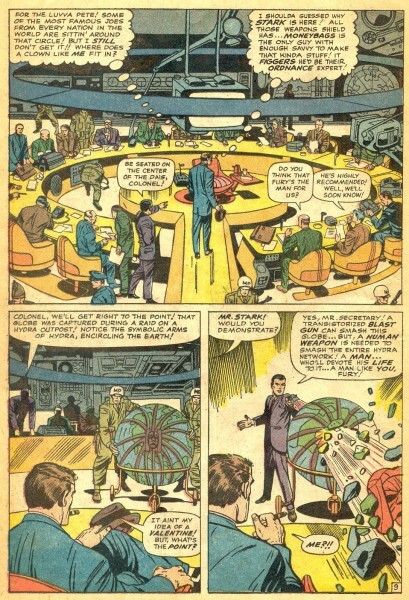 Although the final page features the first instance of vertical reading, the concluding two-panel sub-row echoes the regular 3-panel row that concludes each of Kirby’s issues too. The Fantastic Four #1 (August 1961) includes irregular 4-row pages, regular 2x3s, rows of four panels, and rows of irregular panels. Fantastic Four #2 include the same variations, but 4-rows and 2x3s vanish afterwards. With the exception of splash pages, The Incredible Hulk #1 (May 1962) is also entirely regular 3-row based, with only three pages that vary the format with irregular panels or a regular four-panel row. 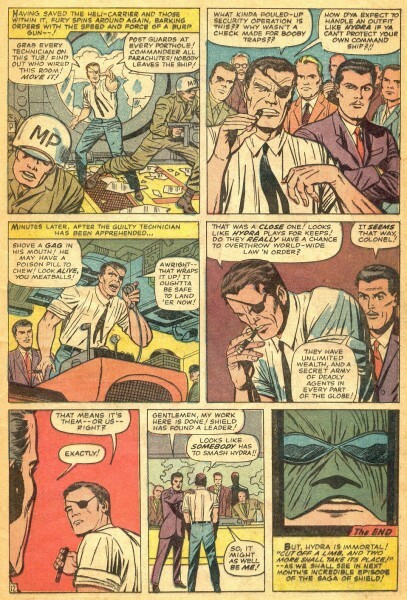 By The Avengers #1 (September 1963) Kirby’s layouts are also almost entirely 3-row based, with no more than three panels per row, and only two rows of irregular panels; the one irregular 2-row implies a 3×3 grid. The X-Men (September 1963), published simultaneously, has even fewer variations: a subdivided panel in a regular 3×2, and one row of two irregular panels. The twelve pages of Kirby’s Captain America feature in Tales of Suspense #59 (November 1964) are even more rigid, containing only regular 3-row layouts, all but one implying a 3×2 grid. The Nick Fury episode of Strange Tales #135 (August 1965), Kirby’s last new series for Marvel, is comparatively diverse. Becoming the Marvel house style seems to have required Kirby to regularize his layouts, presumably so they could be more easily imitated. Variation and innovation are not qualities easily taught, and they do not produce a unified style across titles. 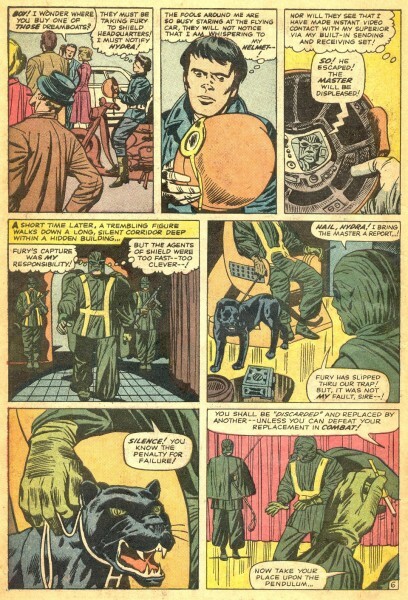 Although Kirby appears to have curtailed his own style to create the Marvel house style, insets and columns are still rare in his early Marvel work too. Fantastic Four #3 does include one, partial inset with its own gutter, and #5 features a highly atypical 1×3 page—which Steranko echoes in his next Nick Fury issue with a three-column page of his own. One of Kirby’s very first comic books, the eight-page “Cosmic Carson” in Science Comics #4 (May 1940), includes four sub-columns, but no page-height ones. The following year, Captain America #1 includes sub-columns too. 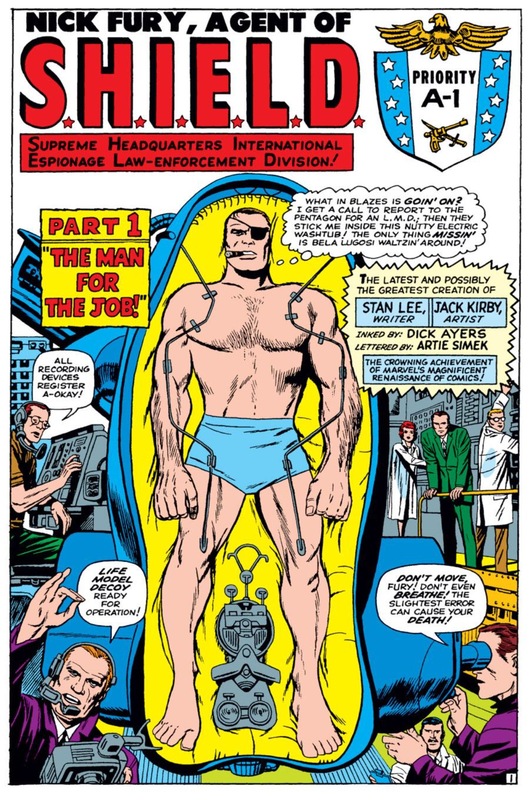 “Cosmic Carson” also shows Kirby’s early use of a regular 2-row with a top full-width panel; identical layouts appear in Strange Tales #s 135, 151, and 152 as well as Steranko’s later #157. 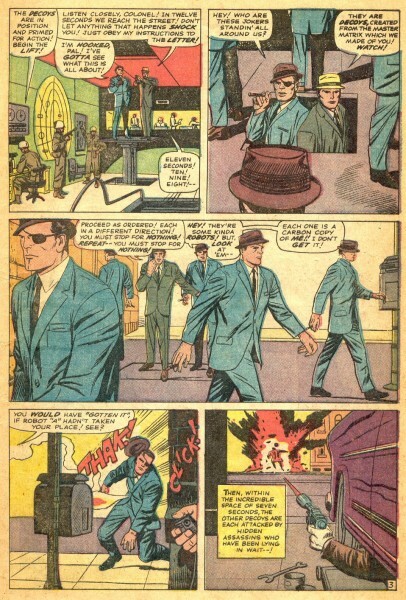 Overall, however, Kirby uses columns rarely, while for Steranko they would become part of his signature style. His next column concludes #160, then beginning with #166, at least one appears in nearly every issue. #166 includes two: a regular 1×2 and, more distinctively, an irregular 1×2 in which the first column is an unframed, full-height figure defining the panel edges of the second column. 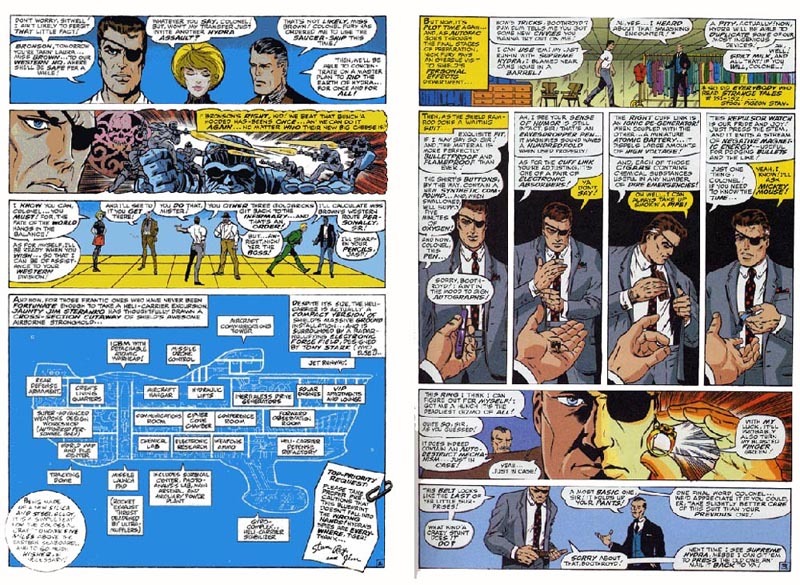 #167 includes no columns—in part because of its seven full-page panels, including Steranko’s innovative fold-out “quadruple-page spread,” which also doubled the price of the issue from twelve cents to twenty-four. an irregular 1×2 with the first column divided into five regular panels; and a highly irregular 1×2 in which the unframed full-height figure overlaps with the three panels of the second column. Nick Fury, Agent of S.H.I.E.L.D then switched to its own independent title, and #1 featured another irregular 1×2 with an unframed, full-height figure. 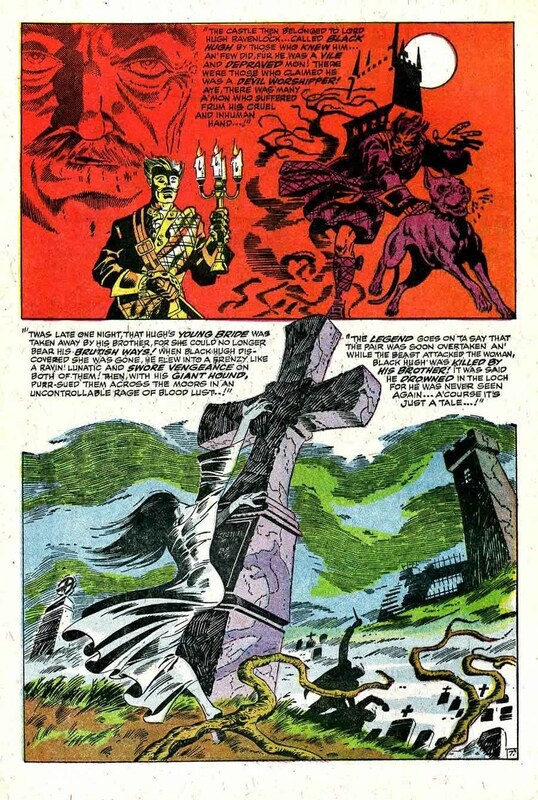 #2 includes a lone column and a later half-column of insets on a full-page panel, as does #3, and #5, Steranko’s last, includes a new column layout of a regular 1×3 with only the middle column divided into six irregular panels. Kirby built the Marvel house style on a 3×2 grid and punctuated it with an occasional 2×2. 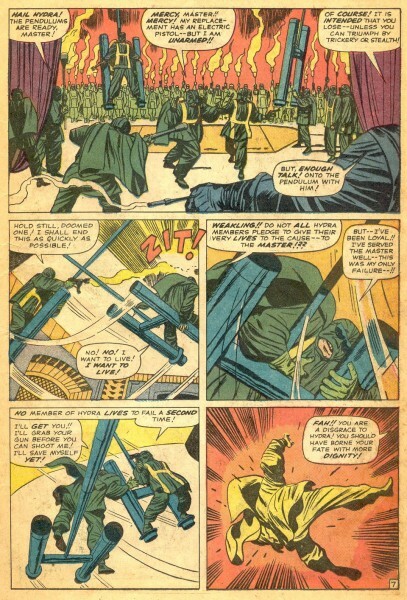 After both Kirby and Steranko left Marvel, Kirby’s flexible page schemes would give way to a norm of irregular layouts, fluctuating between 2-, 3-, and 4-rows, with an open base pattern. Kirby’s Silver Age layouts were gone. 11/07/16 Is Marilyn Monroe a Character in a Comic Strip? So the individual images form a specific path for the viewer to follow. That implies there are wrong paths–or at least paths that don’t produce the aesthetic result that following the intended sequence will produce. I don’t think that’s true of Warhol’s painting or my two variants though. Their arrangements are aesthetically deliberate, but your eye needn’t begin, for example, in the top right corner and proceed to the right in a Z-pattern in order to best appreciate all those juxtaposed Marilyns and Zombie Girls. If you instead focused first on the center square and then scanned up and to the left or any other direction, the aesthetic content doesn’t change. If order doesn’t matter, then the arrangement must not be a sequence. And if comics are sequences, Warhol’s painting isn’t one. It is also composed of thirty-nine visual elements–the same thirty-nine that make up its sibling image. But it is also a sentence, one quoted from comics artists Will Eisner. Unlike “39 Lines,” “WORDS ARE IMAGES” also has linguistic meaning. It is composed of three, separable linguistic units. The first eleven lines form the word “WORDS,” not because of some intrinsic qualities of the lines themselves, but because of an English-reading viewer perceiving that particular conceptual unit. That linguistic property is so obvious that it’s easy to forget that words are also always rendered images–which was Eisner’s point. But, unlike the French flag or the Warhols, sequence does matter. The lines that compose the sentence “WORDS ARE IMAGES” must be perceived in a very specific order for the linguistic meaning to occur. That’s why McCloud includes the adjective “pictorial” in his definition, to distinguish comics from sequences of lines that produce only letters, words, sentences, etc. Your eye is still free to enter and wander freely, but the arrangement of the same ink (or pixels) now conveys an additional meaning. It represents a face. That’s another kind of conceptual unit. The arrangement produces a meaning that is not an intrinsic quality of its individual parts. Like “39 Lines” and “26 Parts,” it’s a single, unified image made of individual parts, but, like “WORDS ARE IMAGES,” the face-lines produce an additional aesthetic response, one that’s pictorial rather than linguistic. The difference is that linguistic images must be perceived in a specific order, and pictorial images do not. Your eye is once again free to wander through the nine faces in any order. But this time, some of the visual elements are letters, and if you read them in the right order, they spell “SUPERHERO.” That’s a sequence. Since those letters are also part of juxtaposed pictorial images, this 3×3 grid fits McCloud’s definition of a comic, while all of the previous examples do not. But is “SUPERHERO” a comic when expanded with wallpaper-like repetition? Like the repeating Thinker figure, the repeating Crying Girl figure doesn’t change her pose. But because the pose is transitory and unmotivated (why and for how long would someone look askance like that, and the laws of physics would have something to say about those suspended teardrops), time does not seem to be passing. The face, like Warhol’s Monroe, does change colors–but those seem to be changes to the image of the woman, not the woman herself. This is not a left-to-right sequential representation of time passing. It is a sequence though. Unlike Warhol’s Monroe, the changes follow a specific order: ROYGBIV. Which produces a pun: “ROY” and “Roy.” So is that sequential element enough to call that 3×3 grid a comic? Here, finally, is something that strikes me unequivocally as a comic. It’s a sequence of an incrementally changing image. In addition to color changes, twenty-six parts of “Crying Girl” move from their face-signifying positions to a non-pictorial clump in the bottom half of the final frame. It tells a kind of story. Which I think is what McCloud means by “deliberate sequence.” He wants comics to be narratives. 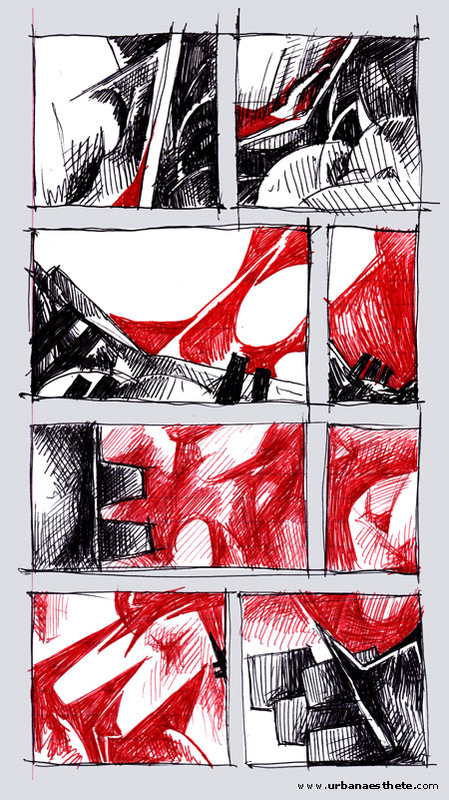 Some of the pages in Abstract Comics, however, appear no more sequential than Warhol. Which could mean some of them aren’t actually comics. They might just be subdivided images. Many are even subdivided into panels and gutters, but do they use those visual elements as panels and gutters? Do they produce a sequence? In this case, the first image, because it’s a photo of Monroe, does represent something other than itself. But that’s not true of the rest of the sequence. Each change is a change to the photo only. They don’t represent changes to Monroe herself. 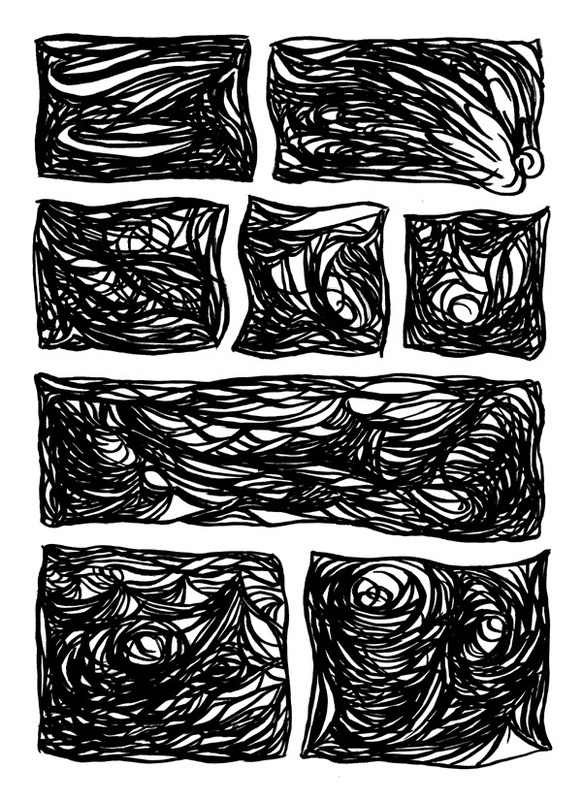 She’s not the character of this abstract, four-panel comic. Her photo is. The same is true of my previous “Crying Girl” variations. Even though they’re representative images of a woman, the woman is not the character of the narrative. Her representation is. So is the Monroe image in Warhol’s painting a “character” too? It undergoes similarly abstract changes, but those changes still aren’t sequential. Neither Monroe nor the repeated representations of Monroe are segments in a visual story. Which is all a very long way of saying: No, Warhol’s painting is not a comic.